Imagine life as a myriad of gateways, leading to meaningful encounters and possibilities, this is the vision that OPEN THE DOOR and the Texan-French Alliance for the Arts invite us to. Every new experience, be it a new phase of life, learning about a new culture, different ways of thinking and aesthetics approaches, meeting new people can be represented by the image of a door. We can choose to leave the door closed, or decide to open it and step across the threshold into action. 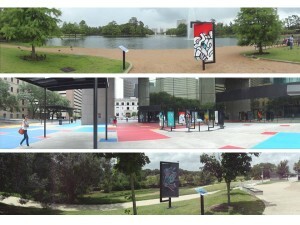 OPEN THE DOOR transformed many parks and communities of Houston by installing 60 doors painted by over 100 artists (established, emerging, students and professors) in 19 locations citywide. The locations created the storyline of a journey, one that begins with a dream, overcomes obstacles of closed doors, and ends with the sojourner’s emergence into “power and change.” By serving and connecting different geographical and cultural areas through this storyline, the OPEN THE DOOR public art installation invited the public (tourists and Houstonians) to discover different parts of the city that they may never have visited before. OPEN THE DOOR gave them a sense of the richness and cultural diversity offered by our city, while showing the power of imagination and creativity to transform spaces and lives. OPEN THE DOOR also became an opportunity for different communities and artists to come together and to inspire each other, and to dare to use their creativity in a new format and new locales. Students, artists, and community members had the chance to exhibit and perform across the city of Houston, giving them a sense of a larger art world and art community. The participants shared ideas, emotions, and moments of life. It showed student artists — some of whom were as young as 11 — that their art and creativity could affect the world in a positive way. Lastly, with street art, by offering a form of expression that embodies communities’ spirit and making it accessible to the public, OPEN THE DOOR took people’s consciousness outside of their house, of their office, and their cars, to see the world beyond walls and welcoming our neighbor through open doors. For two weeks in the spring of 2013, twelve professional artists from France and Texas each turned one side of a door into a work of art. They are part of a groundbreaking public art project called OPEN THE DOOR, originated by the Texan-French Alliance for the Arts and the Paris art collective, 9eme Concept. With these collaborative works of art and other events, we seek to break down social barriers and cultural stereotypes while focusing on intercultural understanding. Open the Door is continuing in Houston through related events, and is coming soon to Dallas. here to learn more about this project and… Open The Door!